It's the fourth day since I have arrived, and all I could do is to sigh, as I have no means to record my thoughts and feelings of the moment. I wanted to write down my emotions the moment I stepped into Narita Airport, but all I could do is to hope that my brain's recording function won't falter. I was pretty happy that we were told to kill time in the 100 Yen shop that is just 5 minutes away from the school we had our institutional visit. The first shelf I visited is the stationery. There were a lot of plain books, but I just could not find the one that I like. I spent a good 15 minutes going through the shelf. 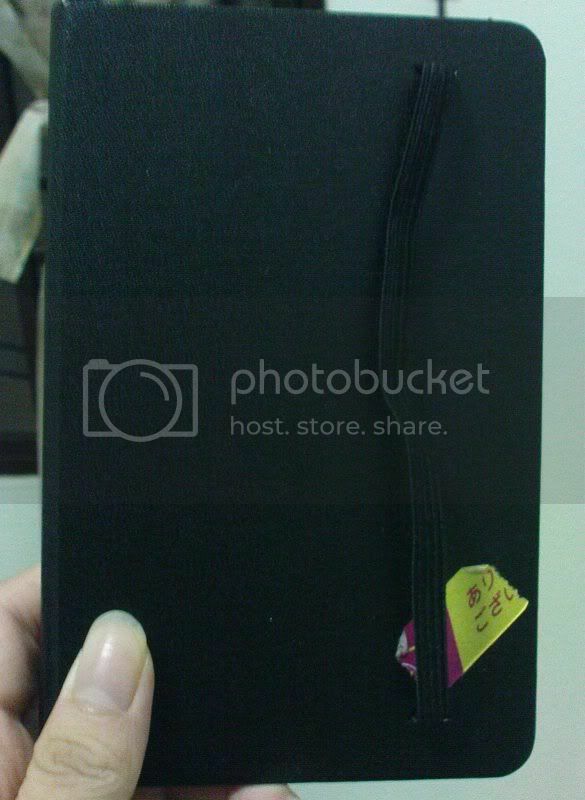 I finally settled for a black book. It reminds me a lot of moleskine ruled notebook. I preferred a thicker one, but there is none to my liking. Besides, I have to think of the book's mobility too. The size of the notebook is perfect for my handbag and it won't add additional weight to my already restricted baggage weight. 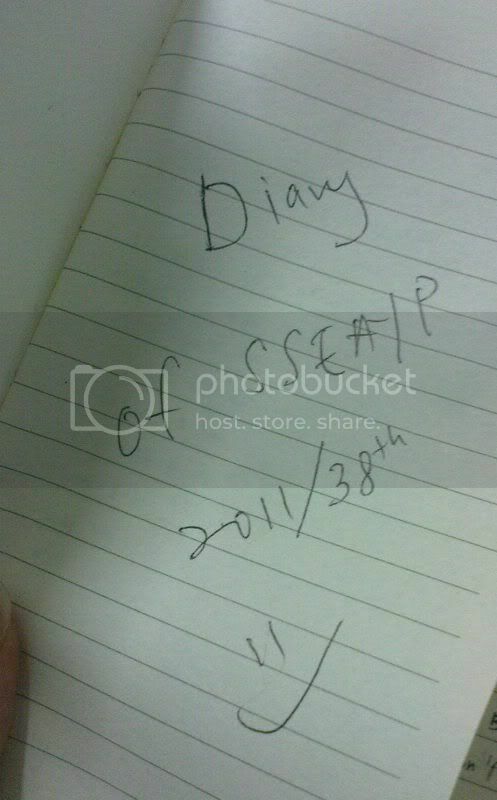 Spinoff: Despite buying the book before going on board, my first entry was dated 5 November. I was actually reluctant to buy the notebook because I have already prepared a thick one back home. However, it is extremely unfortunate that I cannot bring it along due to limited baggage weight. In fact, I didn't even have allowance for toiletries. I bought them in Japan and survived on samples I obtained earlier. After our visit at the Mini Bali, we headed to a shopping mall's restroom to change our outfit for our next event: Dinner. The main committee member for the host family association in Indonesia decided to throw in a gathering dinner for all families with their anak angkat (adopted children). Not knowing what does the dinner entail, the four of us were given two sets of identical costumes the night before the dinner. I wanted the pink costume because I think it will look better on my skin colour, but unfortunately its size is smaller than the brown one. And you know what? I needed oxygen badly. Because the costume is so small! And I have to tuck in my stomach all night in that costume. I didn't eat much either. As you can see from the picture, I am really controlling my breathe and tucking in my stomach! The most adventurous part is not pleading for oxygen but the catwalk show! All the other anak angkat were dressed up in the traditional Indonesian costumes, and the host parents proudly present us via catwalk. All host parents were vying for the best costumes prize. My host mum was beaming with smiles. I didn't win but my fellow female Malaysian member won the best costume prize! Tidbits: Luckily, I lose weight before and during the program. If not, I won't be able to fit into the costume. And my host mum has no spare costumes. I surmise my host mum really knows how to flaunt her four female anak angkat's bodies!! I supposed mama was also lucky to get 4 moderate-size girls! Cannot imagine otherwise! I noticed my fly was partially open in a picture taken with a friend during my program on the ship, but I decided to keep quiet about it. However, my statement of the picture made my friend who uploaded the photo noticed that the fly was open. I should not have written "Ah! There's a chopstick in my pocket." That sentence drew attention to the red spot of my zipper. And my friend argued that the fly is open. It's my jeans, for god sake. I was wearing the best and most comfy jean I have from my wardrobe. My definition of best means the fly doesn't get open so easily, and the threads are intact. (Yes you read it right: Threads are intact. I have jeans where the threads are already loosen ... it makes me look hippy whenever I wear that for lunch). So now in conclusion I am not sure if my fly is open during the taking of the photo. I don't even want to analyse it. Wait, hang on. Right. It's confirmed that the fly is not open. The zipper part is red in colour. I just checked my jeans. I have demanded my friend to edit the photo by the way before our other mutual friends thought the fly is open. A friend shared this video during an organisation meeting, and shared that we should think before we buy as the ecosystem and the wildlife are now the collateral damage to our consumerism culture. I actually wanna say out loud in the meeting what is the point of watching such emotional video when WE at this very moment are not doing ANYTHING NOW to minimize such damage? My sister works very hard to spread environmental education within the organisation but it is not appreciated when there are times members said it's not convenient to be green. Correction: It is Never convenient to be a greenie. And yet our organisation endorsed the Earth Charter. What a joke. Of course, my friends who are of high-ranked in the organisation will be unhappy with my complaints, but the stark truth is WE never practiced green ways. If yes, it's not ENOUGH. I still could cope watching those dead chicks being stuffed with plastics, but not watching how pests eating native wildlife. Actually if possible I would like to avert my eyes from this sad documentary. The chicks ... were just born in the wrong era. What a tragic way to die. Their death is not even a natural one but man-made. Even if I sent millions of prayers to the environment, I cannot do so much to prevent such unnatural disasters. And albatross chicks are such cute and adorable animals. Can you just imagine if they were human babies with their stomach stuffed with plastic? It's a nightmare. It's too gruesome to imagine that? You don't have to. Just do your bits for the environment. We just don't have to be so territorial. I started off March with amazing events. Friends from Brunei and Finland came to Malaysia for holiday and I was very happy to meet them especially the ones from Finland. =) There is a possibility of me not able to go to Finland to visit the couple. How nice of them to visit me in Malaysia after I googled them Malaysian restaurant in their country. Coincidentally the restaurant is just a few doors away from their home! I was happy that she gave me a bag of Finnish chocolate!! Ooh. I have been eating chocolates as breakfast for the past two days. As for the Bruneian friend ... it sounded so wrong. I never thought I will be meeting him up since he mentioned he was invited to some musical play, but decided to skip it to have a quiet night with friends. Because I need to meet up with my Finnish friend on the same night as him, I decided to meet him up at one of the oldest restaurants nearby his hotel. So I instructed him to walk over to the nearest shopping mall to wait for me. And do you know what he said? He texted me that he doesn't know where the shopping mall or where to walk and bla bla. So in the end I replied that I will meet him at the hotel at 5.40 pm. When I reached the hotel at 5.30 pm. He is no where to be seen, so I went up to his room to pick him up. When we were in the room, he said "It feels so wrong for a girl to pick up a guy for dinner." But we had a great night! So who cares! This song is very nice to listen to. =) Hope you guys like it as much as I do. It's by the Filipino heartthrob: Christian Bautista and Angeline Quinto.